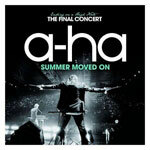 The live version of "Summer Moved On" (4:58) taken from a-ha's final concert in Oslo on 4 December is released in Germany. It also features the live version of "Scoundrel Days" (4:20) taken from the same show. The front sleeve features a full cover black and white shot of a-ha on stage taken from the back of the stage, behind Morten who is playing drums during the song "The Bandstand". The name of the live album "Ending On A High Note - The Final Concert" is printed in blue and white at the top of the sleeve with a large white a-ha logo below and "Summer Moved On" in blue below that. The reverse of the insert features a black and white live shot of the band with streamers falling from the sky. The tracks are listed in white on the left hand side. The German edition has a gold sticker on the bottom right hand corner of the case with black and white text: "TAKEN FROM THE FAREWELL SHOW AND UPCOMING LIVE DVD "ENDING ON A HIGH NOTE THE FINAL CONCERT"". The disc is black with "Ending on a High Note The Final Concert" in white and blue letters at the top plus "a-ha" and "Summer Moved On" is respectively white and blue letters at the bottom.